This Order from last week exposed a potentially pretty significant rift. It’s one thing to require electric vehicle charging capacity in new residential and commercial construction, but providing charging stations on public streets basically means that only those who can afford a $100,000+ Chevy Volt or comparable vehicle will be able to use those parking spaces. [Correction: It’s the Tesla Model S that went for ~$100K. The Chevy Volt apparently goes for ~$30K.] It’s understandable that people without driveways might want a mechanism for charging their cars (since running power cords across the sidewalk or down the street is not an option), but how will it go over with the neighbors if only some people are privileged to use these parking spaces? Unfinished Business #3. A communication was received from Donna P. Lopez, City Clerk, transmitting a report from Vice Mayor Devereux, Chair of the Ad-Hoc Rules Committee, for a public hearing held on Tuesday, Jan 16, 2018 to discuss and suggest changes to the City Council Rules and transmitting recommended changes to the City Council Rules. I honestly don’t know what Rules Changes they finally settled on at last week’s meeting. The meeting materials only show the suggestions from the Ad-Hoc Committee and it’s simply not worth reviewing the video to find out what the Council decided on before referring the revised version to Unfinished Business. It’s primarily just nickel-and-dime stuff anyway. Communications #16-25 and #27 transmitting written opposition to the Peter Kroon, et al. Harvard Square Overlay District Zoning Petition. In addition to these communications, most of the public comment at last week’s Ordinance Committee meeting was against the petition. I believe there may now be or will soon be expressed written opposition from more than 20% of the affected land ownership which means that a three-quarter super-majority vote would be needed to pass the Kroon Petition, i.e. 7 votes instead of 6 out of 9. I don’t think it had the votes anyway, but it apparently doesn’t matter because the Ordinance Committee failed to move it out of committee so it can’t be passed to a 2nd Reading on Monday and it therefore cannot be ordained prior to the expiration date. It seems likely that a revised version will be filed after the Feb 19 expiration. One particularly offensive part of the Ordinance Committee discussion centered on term limits on membership on the Harvard Square Advisory Committee and the desire of the petitioners and some councillors to drive one particular person out of the Chair and maybe even off the advisory committee entirely. There is a notification in this week’s agenda for the reappointment of two 20+ year members to the Library Board of Trustees. Will the City Council now argue that they should be booted from the Board in the quest for "new blood"? City boards & commissions benefit greatly from having a mix of newer members and long-time members who carry a lot of institutional memory and skills. Having a good balance is what’s really important. This is a timely order. The Trojan horse of medical marijuana facilities has already entered the city and it has the munchies. It is quite apparent that groups like the Harvard Square Business Association and the Central Square Business Association are already taking on some of the rules associated with a Business Improvement District. This may be the right time to make this official in Central Square. The benefits are many and the down sides are few. 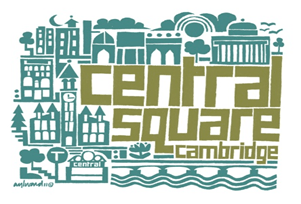 PS – The Central Square Business Association and its most excellent Executive Director Michael Monastime hosted an especially good charrette on Saturday on the future of Carl Barron Plaza in the heart of Central Square. This was just the first of what will be many opportunities for public input on the upcoming River Street reconstruction project (from the river to Carl Barron Plaza) that will commence at some point in the next year or so. This is a welcome request. Most people have no idea what spaces are available for use and what rules govern the use of these open spaces and meeting spaces. It will be great if this information can be made available along with information on all City-owned resources that are available for public use. Ideally there should also be a list of all spaces in churches and other buildings that are available for use at modest cost for meetings and events. Suffice to say that if during the construction of that dedicated sewer line the century-old water mains and gas mains are replaced (which will have to occur at some point anyway), that is, in itself, significant mitigation. If some of the electrical infrastructure can also be renewed and moved from poles to underground that would be even better. This is a complicated project with the potential for a lot of benefit and a fair amount of disruption during construction. I won’t offer any opinions just now, but there are plenty to go around. It’s worth the read. Communications & Reports from City Officers #2. A communication was received from Mayor Marc C. McGovern, transmitting the City Council Committee Assignments for the Council Term 2018-2019 pending adoption of the Rules as amended. One of those EV cars was quoted as being in that range. In any case, I paid $1200 for my Bus in 1999. (1). Most private commercial parking garages in Boston and perhaps Cambridge have installed electric charging stations—between 1 and 5 per garage. Residential garages as well. (2). Commercial garage owners began installing these five years ago thinking that electric vehicle populations would rise reasonably quickly but they have not. In general, privately installed electric charging stations in garages are very lightly used. Most residential garages have installed electric charging stations as well. For private enterprise, the cost of installing such stations has been near zero because the companies involved in providing them charge for the charging service and recoup their costs in this manner. (3). The City of Cambridge will discover, I believe, that the idea of delivering power to a street charging station is only feasible where street lighting power can be diverted to this use. Otherwise, there is no obvious City Controlled source of power for the purpose. Placing charging stations in City property including garages and public lots might be easier because appropriate sources of power would probably be more readily available. (4). If the City installed street electric stations, they will discover that there will be unique parking enforcement issues related to such spaces in any areas where parking supply is currently tight. This might be a source of discomfort for non electric vehicle owners like Mr. Winters (not to put words into his mouth) who suddenly are at a disadvantage to electric car owners. (5). Any resident of Cambridge that buys an electric car—even a hybrid—almost automatically buys a home charging station because their use of the car requires a reliable and regularly available charging source for a significant period of time during a period that is expected to be “down time” for their auto. Market penetration of electric vehicles of any type in Cambridge is probably 1% or so. It would require something like 20% penetration to require City installed or “common” electric charging stations for Cambridge residential benefit. Therefore, if the City installs street charging stations now, those will principally serve visitors or commuters TO Cambridge. (6) On the subject of expense of these vehicles, I would note that I have been personally looking at the possibility of buying an electric car for the past five years and I have not, to date, because these vehicles do not yet have a combination of range, battery life and cost that justifies a purchase vis a vis a car deliberately chosen for high fuel efficiency. I believe that most of us are rational and have discovered essentially the same thing and that this is why so few electric cars have been sold to date. This line of thinking suggests that the City should view all of its early forays into electric car usage and infrastructure provision as an experiment—as a useful way to learn about the various ideas associated with the new technology. In keeping with everything I said above, I would advise the City to absolutely proceed with various experiments to understand how electric vehicles would work in our City but with the understanding that experiment means just that—doing just enough in a controlled way to understand the various principles involved. That suggests a program that has a budget of, say, a few hundred thousand dollars total rather than some very substantial financial commitment. Vis a vis purchase of electric vehicles, I believe that the City will find that there are as many problems with electric cars as there are with conventional ones at this time. Five to ten years from now, it might be different. One final comment. Electric cars, while running on electricity, actually run on whatever power source produces the electricity. For us in New England that means hydroelectric and natural gas principally. Electric motors are more efficient than internal combustion engines but there are inneficiencies in the delivery of electric power as well. Electric cars are a very interesting idea but they should not be regarded as some kind of holy grail until or unless a way is found out to make them as user-friendly as internal combustion vehicles.